A few weeks ago, someone emailed me the following message about registering a domain name at eNom, the domain name registrar owned by publicly traded Demand Media (DMD). At the time I received that email, I tested the registration process, but it didn’t happen to me, so I figured it was probably an isolated incident. Today, when I went to hand register a domain name (WhateverYourHeartDesires.com), I was sure to only leave the .com field checked, as you can see above. 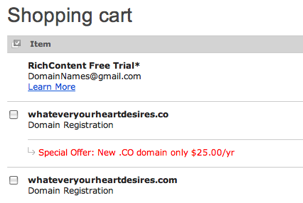 However, upon proceeding to the checkout screen, the .CO domain name had been automatically added to my shopping cart. Had I been paying less attention, I could have very easily hit the checkout now button and bought a domain name I didn’t want or need. In addition to this, there was also something called the “Rich Content Free Trial*” which had to be manually removed from my shopping cart as well. I didn’t review the *fine print, but my bet would be that it discusses that a free trial then turns into a paid renewal, which would be equally or possibly more annoying. I don’t know if this is the case for certain, but it would seem to be so. I understand when companies use a checkoff box to encourage you to buy other domain names. However, it’s very annoying when I uncheck the box and they automatically add it to my cart. Why not just add .net, .org, .biz, .info, .us, .ws, and .name just for good measure? I guess they figure people might notice that but are less likely to notice a .CO. I hope Enom will stop this. this article is a waste of space, as are you. Thanks for the warning. If you help someone save a few bucks, then it’s all good. BTW, pay no attention to trolls who have nothing better to do. I have learned a lot of good info from your blog, so keep it coming. I tried it twice and .co didn’t get added but their GoMobi trial keeps getting added to the cart. guess the ammount of refunds made them quit that lil experiment. wow what a scumbag move. And then people really wonder why people are so anti .co ? Do you really think enom just did this all by themselves, as a goodwill gesture throwing a fledgling domain extension automatically into carts ? I don’t know, maybe, but sounds shady as hell. On a side note, GREAT HAND REG. Money phrase right there. Is it a fresh reg or did it just drop and you scooped it up ? Fresh hand registration, but it had been previously registered. My wife’s grandmother left her a message and said something like, “whatever your heart desires.” I think it’s a great phrase and bought the domain name. Yesterday I renewed two dot co there I forgot about, and paid through the nose. I spent have my time online deleting .net and org that they automatically put in my cart. What was strange is it was of a LLLL .com I have registered with Godaddy and for sale at Afternic ??? That’s not so bad. 1 & 1 had a special on .Com’s last month and again this month I see for 4.99. When I got the bill they charged me the regular amount for each .Com and when I responded via email about the erroneous charges they told me there was nothing they could do but issues credits on the next cycle. I told them that was unacceptable to overcharge me when it was their mistake but they wouldn’t change their mind. Oversee may be shady too but Moniker, although it ain’t what it used to be, never pulls this crap. Most other registrars have the most confusing and convuluded checkout processes where you could accidentally buy just about anything. I agree with what you are saying. This is one of several examples of .CO basically being pushed on people. Just like the GoDaddy’s switch to making .CO default. I guess they got sick of processing refunds and changed it back quickly. There are 2M – 2.5M .COM regs per month. There are even 300K+ .NET and 200K+ .ORG regs per month. What percent of the traffic to these registrars really intend to register a .CO? A tiny fraction of .COM/NET/ORG. It is clearly not enough to be forcing .CO on people. you are just as guilty showing one side. I am talking about total registrations here, which is what registrars care about. .CO has not had an opportunity to drop any domains yet, so that is apples to oranges. COM/NET/ORG have 30X+ as many registrations in the last year as .CO. I am pointing out the fact the vast majority of traffic is not there to register a .CO. @Robert – I checked rcu.co. Its a defensive reg that forwards. Doesn’t appeared to be used as main site. the credit union is using it as their main site. 96% of the links are working correct. what do you expect, it still relatively new. iPhone app ‘Groupie”s website now redirects to ‘groupie.co’ from the google indexed ‘groupie.mobi’.